Delaware was the first state to ratify the Constitution in 1787. 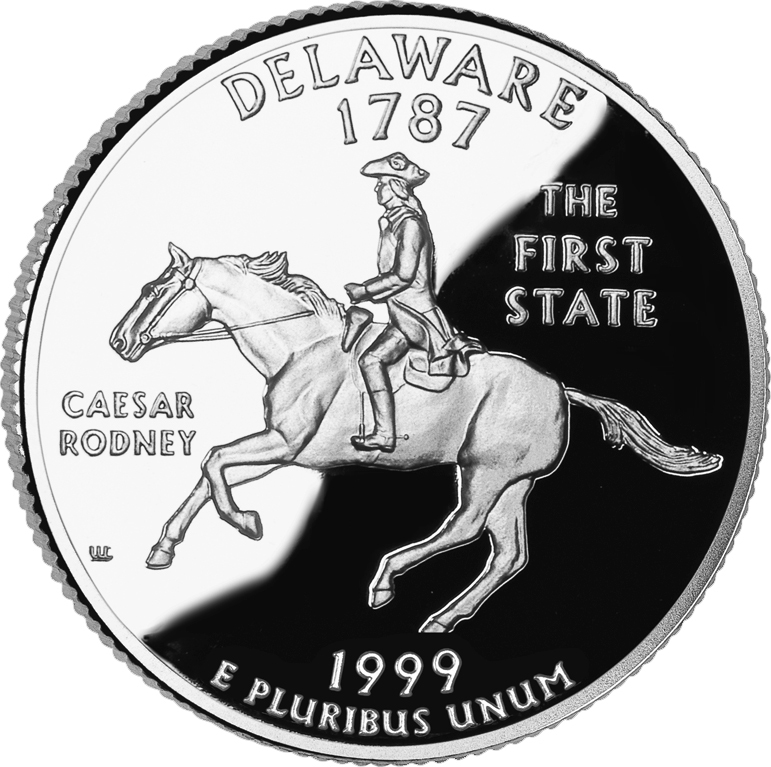 The U.S. Mint's commemorative quarter for Delaware features Caesar Rodney on horseback (signer of the Declaration of Independence and president of Delaware during most of the American Revolution), and Delaware's official nickname: "The First State" (public domain image on Wikipedia). Small Wonder: This nickname was given to Delaware due to its size, the contributions it has made to our country, and the beauty of Delaware. 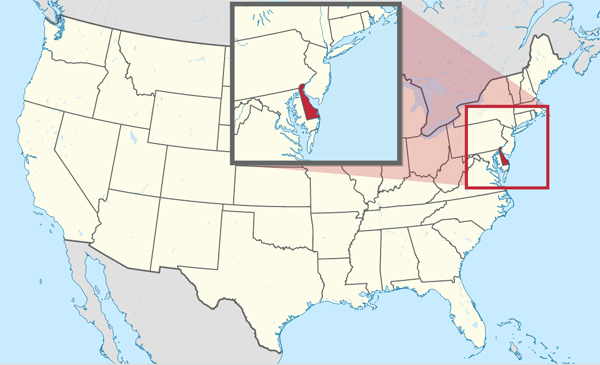 The Diamond State: According to legend, Thomas Jefferson gave this nickname to Delaware - he described Delaware as a "jewel" among states due to its strategic location on the Eastern Seaboard. 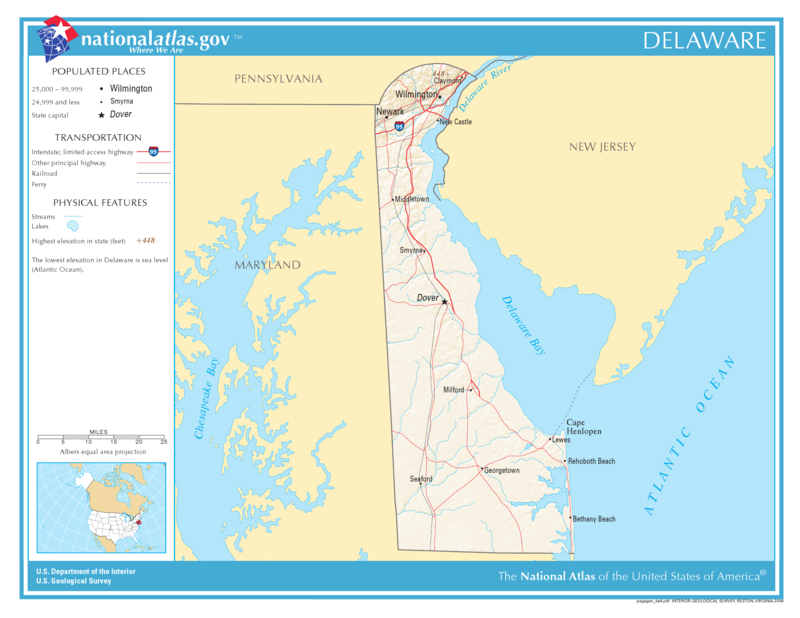 Delaware; a map showing major population centers, major transportation routes, and physical features (including streams, lakes, and bays). Photo by National Atlas of the United States/Wikipedia (public domain image). 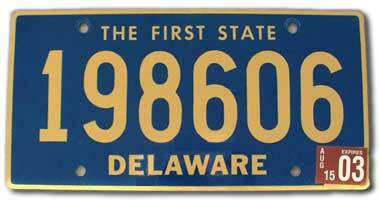 Delaware blue and buff license plate with official state nickname: "The First State" (colonial blue and buff are Delaware's official colors). Colonial blue is actually a lighter shade (seen on the Delaware flag), but the blue on the plate is darker for contrast / visibility. Photo by Norm Russo (used by permission).